The intrepid Professor Liedenbrock embarks upon the strangest expedition of the nineteenth century: a journey down an extinct Icelandic volcano to the Earth’s very core. In his quest to penetrate the planet’s primordial secrets, the geologist–together with his quaking nephew Axel and their devoted guide, Hans–discovers an astonishing subterranean menagerie of prehistoric proportions. Verne’s imaginative tale is at once the ultimate science fiction adventure and a reflection on the perfectibility of human understanding and the psychology of the questor. You may be wondering why I used the original French title of Journey to the Center of the Earth in the blog title…that’s because I read this book in French! 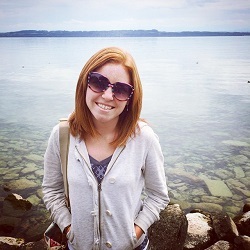 If you’ve been to my blog before, you may be familiar with my list of 25 things to do for my 25th year. #3 on that list was to “read an entire book in French.” So I can now cross that off! It wasn’t easy–the French language has a special past tense that is only used in books or in storytelling, which makes it really hard to learn because you’ll hardly ever have the need to use it in a conversation. To be honest, I did not understand everything that goes on in this book, but I picked Jules Verne to read because 1) French Classics are easier to understand than English classics because the French language has barely changed over the centuries, 2) Classic novels have more grammatically correct dialogue between characters as opposed to modern novels, and 3) Jules Verne writes suspenseful and captivating adventure novels that are easy to follow and visualize. On to the book! The only other Verne novel I’ve read before Journey to the Center of the Earth was Around the World in Eighty Days, which I really enjoyed. Verne’s characters are so particular and unique and the adventures they go on are always full of suspense and those “this is our last hope” type of scenes so that you’ll never be bored while reading one of his novels. Professor Lidenbrock is ever persistent and hopeful during this life-threatening journey while his nephew, Axel, often exclaims that all hope is lost and the group is sure to perish. …you’re into science fiction books, especially those written by the fathers of sci-fi. …you crave a book that will make you both laugh out loud and turn the pages in suspense. …you’re looking for a new unforgettable adventure to experience. 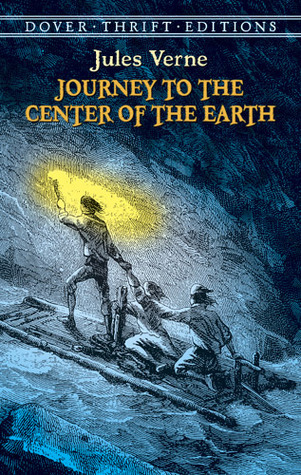 If you’ve never read a novel by Jules Verne, I would suggest Journey to the Center of the Earth as a good starting point, although I preferred Around the World in Eighty Days (really though, any Verne book is a good book to read). Full of quirky characters, daring adventures, and spectacular imagery, Journey to the Center of the Earth is definitely a classic that deserves its masterpiece label. I’m so impressed! I would love to get my French up to the level where I could read a whole book in it! I bet it felt so good to accomplish this one! I felt so accomplished when I finished this book!! Jules Verne was a great choice because his writing is very easy to follow, but like I said, I didn’t understand everything that happened in this book, but I followed the plot pretty well. I hope you’re able to read a book in French one day! It doesn’t have to be a big classic, there are plenty of shorter French novels out there :) I’d like to read Le Petit Prince. Yay! Well done for reading a whole book in French! I know how good it feels to read an entire book in another language :D And Le Petit Prince is a great one too (reading your above comment!) – quite simple but really thoughtful, and a definite classic! Thanks!! Which books have you read in a foreign language? Yeah, the French language is not as malleable as English. You can’t create verbs out of nouns, for example (although some people try). There are some words that they don’t use anymore, but it’s not like in English where the sentence structure has become almost “lazy”.